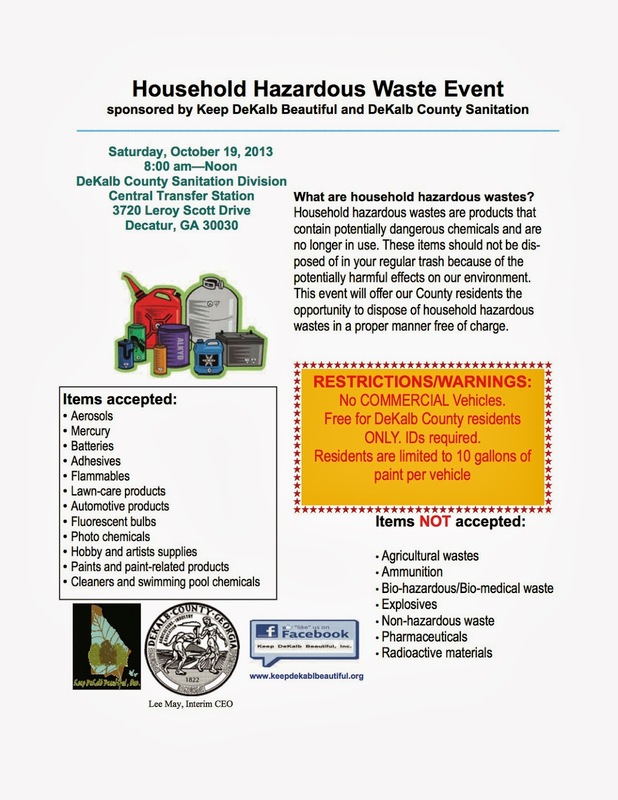 Free to DeKalb Co. residents (ID required). No commercial vehicles! 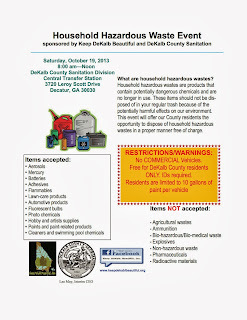 Hosted by Keep DeKalb Beautiful and DeKalb County Sanitation. "Enjoy a day of family fun, including pony rides, kids' crafts, costume contest, riding and equestrian drill team demonstrations and salute to the military, pet adoptions, the Atlanta Mounted Police, and much more! Admission $5, children under the age of 4 Free! Pony rides: $8 including a professional photo shot for download after the event. Children must be at least 36" to ride. Rain or shine! Cash or checks transactions only." "The Festival on Ponce is an Atlanta arts and crafts festival set in the historic park, Olmsted Linear Park. Visitors will enjoy the gorgeous landscape designed by one of America's most celebrated landscape architects, Fredrick Olmsted Sr. along with over 125 displays of fine arts and crafts, folk and "outsider art". In addition to the fine arts, there will be a children's area and local food and beverage. Attendance is Free." "Please come to the Clyde Shepherd Nature Preserve on Sat 10/19 from 9 am -noon for a MANA-sponsored cleanup to clear brush and haul away debris. CSNP staff will be on hand to oversee the work and provide all needed tools - we just need YOU to show up ready to work! The CSNP annual fall festival will be the following weekend, on 10/26 so you will be able to enjoy the fruits of your labors and join your neighbors in celebrating fall. MANA will provide coffee, water & snacks - to help us with planning, please RSVP to csybdr@yahoo.com. Hope to see you there!"